Born September 2nd, 1902 in Penllyn, Pennsylvania. Died in 1986 in Princeton, New Jersey. 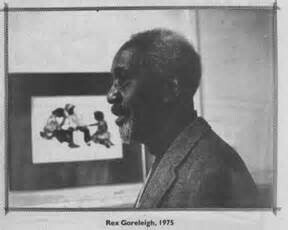 Rex Goreleigh was born in Penllyn, PA, where he took to art as a way of coping with a speech impediment which he had since he was a child. He then moved to Philadelphia at the age of 15, when his mother died. A year later, he left for Washington DC, to attend high school there. 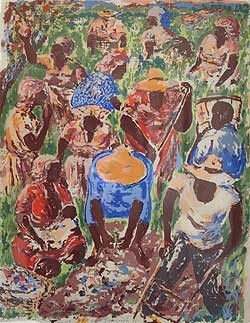 In 1920, Goreleigh attended a series of displays of African-American art at the Harmon Foundation exhibition in New York. Seeing the exhibition inspired him to learn how to paint and draw, in the off time of his day job of waiting tables. Thirteen years later, Goreleigh waited a table for the prominent Mexican muralist, Diego Rivera, who gave Goreleigh the opportunity to watch him work on portraits meant for Rockefeller Center. In 1934, under the WPA, Goreleigh met and worked with Ben Shahn, another popular artist. Until 1936, he studied art in Europe, and upon returning to America, he taught in both Harlem and established an art center in Greensboro, North Carolina. Alongside Norman Lewis, the pair worked in Chicago as well, in art centers in southern Chicago. 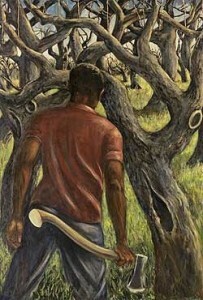 Goreleigh moved to Princeton in 1947, and directed Princeton Group Arts for another 6 years. He died in 1986. Rex Goreleigh devoted a large number of years to educating the Princeton community on the arts through the Princeton Group Arts, from 1947 to 1953. The organization placed an emphasis on teaching lessons, as well as on hosting exhibits and concerts for the community.